The Expanse – Season 4 – Amazon Saves Us! Just before I began work on The Boys last summer, my Expanse team were all waiting with baited breath as to the fate of The Expanse with our network, SyFy. As it turned out, SyFy decided not to renew us for a 4th season… but after 10 days of intense fan outcry; which included a crowd funding campaign which saw a plane fly over the Amazon HQ in Seattle with a banner reading “#savetheexpanse” behind it. 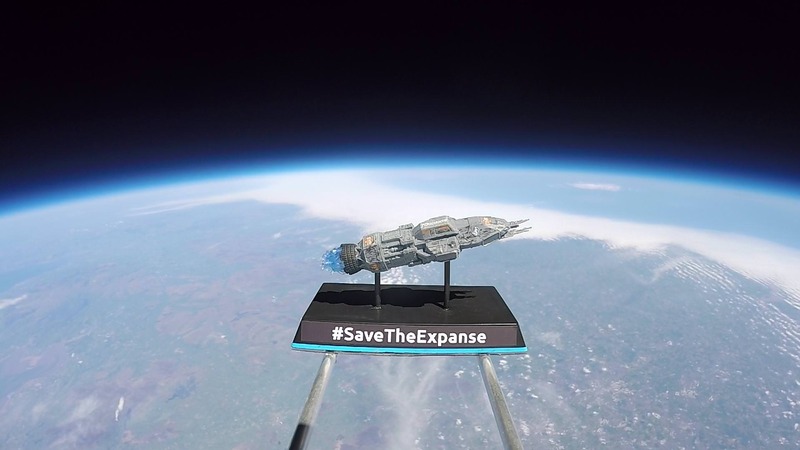 Then there was also a model of our hero ship, The Rocinante, in orbit of our planet with the same hashtag slogan on it. It was a very emotional and inspiring time… to be so deep inside a world we had built for 3 years and seeing the outpouring of love and support by some of the most dedicated fans I’ve ever seen on something I’ve been part of. Eventually the stunts and tweets to Jeff Bezos worked… as he personally announced that the show would be taken on by Amazon. One of the big things I am excited about this season is that we get to finish the show in HDR… something we wanted to do last season but there was not the budget for it. This is part of Amazon’s mandate, so now we get to do it! What a ride, is all I can say. Our sets were being scrapped when this announcement came out. Now we are 9 weeks into principal photography at the time of this writing. This year is by far our biggest and most challenging yet. I hope the fans love it as much as we’ve loved making this show over 4 seasons. Thanks to all the support our fans have given us.